If you have suffered a TBI due to someone else’s negligence, you deserve a compassionate attorney that can help you navigate through the seemingly overwhelming journey of recovering from a catastrophic injury. When you need a brain injury lawyer in Florida our team is here to assist you. Our law firm has over 35 years of experience in personal injury claims in which we have won large settlements. However, we are most proud of being able to help restore our clients back—as closely as possible—to the meaningful, productive, fulfilling lives they were able to lead before confronted by a catastrophic injury. A TBI is trauma caused by an external force, rather than disease that disrupts the normal function of the brain. Symptoms range from “mild” with a brief change in mental status or consciousness to “severe” with an extended period of unconsciousness or amnesia. The most common form of a TBI is a concussion that may result from motorcycle or car accidents, falls or contact sports. But according to the Centers for Disease Control and Prevention, it is still a major public health problem. Each year, about 1.7 million Americans sustain a TBI, leading to a substantial number of deaths and cases of disability. Furthermore, TBI’s cost the country more than $56 billion a year in direct and indirect estimated costs. TBIs have recently received a lot of media attention as mounting evidence links even repetitive minor concussions to long-term brain damage. The elevated focus has come from a barrage of concussion lawsuits that former NFL players have filed against the league. TBIs haved also gained notoriety as the “signature wound” of soldiers who have suffered blast wounds in Iraq and Afghanistan. Although these groups are making headlines, you don’t necessarily have to be an athlete or a military veteran to sustain a TBI. Many civilians are also at risk of experiencing a TBI from a bump from falling head first, a blow to the head from an assault or a jolt to the head from whiplash in a car accident. While there can be clear signs of brain injury such as a penetrating head injury from a gunshot wound or knife wound or other object driven through the brain, other forms of severe TBI such as closed head injury caused by movement of the brain within the skull may not be as obvious. A diffuse axonal injury [DAI] is a type of closed head injury that results from the brain moving back and forth within the skull as a result of acceleration or deceleration. When this occurs, the axons, the part of the nerve cells that allow neurons to send messages between them are disrupted, causing a shearing injury to occur, which may result in a mild TBI in the form of a concussion or a severe TBI with a coma. In addition to whiplash, common causes of DAIs also include sports-related accidents, falls or child abuse such as the violent shaking of the head known as shaken baby syndrome. 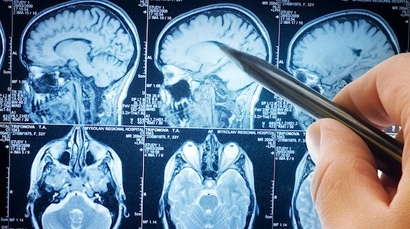 If early symptoms of a TBI appear mild, it can give the false impression that it’s not serious. However, it’s important to seek immediate medical attention because there may be significant, life-long impairment in an individual’s ability to function physically, mentally, and emotionally. It’s also critical to be aware that these are myths. • If you are not struck on the head you cannot have a TBI. • If you are not rendered unconsciousness you cannot have a TBI. • A mild TBI is always only temporary. These myths have been disproven time and time again. The facts show that a sudden jolt to the head with no direct blow, may cause a concussion or TBI. A concussion may occur with only a period of being dazed or confused for less than 15 minutes instead of a loss of consciousness. And while a mild TBI may heal on its own, some people will face long-term effects and symptoms, which has been coined post-concussion syndrome. Unfortunately, some insurance adjusters may rely on misinformation to deny a personal injury claim. So, if you have suffered a TBI due to someone else’s negligence, it is crucial to seek the guidance of attorneys who are familiar with the medical advancements and life care planning involved with a TBI diagnosis. Our experienced and knowledgeable attorneys may be able to help guide you through the process of filing a personal injury claim. If you would like to talk with a representative about your case, please contact us.